She was thrilled with the restaurant scene in Minneapolis; a huge difference from what she was used to. Not only the setting but in terms of the variety. She also enjoyed my home cooking, something she didn't know much of since I left home before she was able to appreciate my recipes. Luckily, she devours everything I make; I little bit of affirmation that I, in turn, enjoy. This recipe was created just for her. Tofu and mushrooms. Two foods eaten in Trinidad but not widely popular. Consequently, and coupled with the fact that she is sometimes a picky teenage eater, she was not particularly fond of the idea that I would "make" her eat it. ( One of the reasons I doubt she enjoyed every minute with me: there was no " I don't like that" protesting allowed when it came to healthy eating.) In the end, I won he over with fresh portabello mushrooms. "I have never meet a mushroom I didn't like,"she said. 1. Remove the tofu from its package and wrap in dry paper towels. Place on a plate and set another plate on top of it. Onto the second plate, set a heavy weight such as a can of beans. Place in the refrigerator for at least an hour. This step is very important because it removes most of the extra liquid from the tofu resulting in a crumblier and less soggy topping. 2.Set the oven to 400 degrees F. With a damp paper towel, gently wipe any dirt off the outer surface of each mushroom. Remove and discard the stems. Set on a well greased baking sheet or baking dish. 3. Remove the tofu from the refrigerator (from its homemade "liquid extractor") and crumble into a bowl, either using your hands or a fork. To this crumbled mass, add the cheese, scallion, bread crumbs, salt and pepper. Mix well. 4. 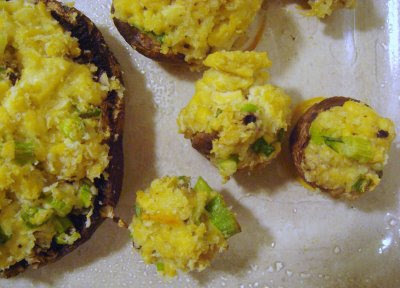 Fill each mushroom cap with the crumbled tofu mixture, and drizzle lightly with grape seed oil, if using. Bake for 15 to 2o minutes until lightly golden brown on top. my wife loves stuffed mushrooms. thanks for the recipe! they look great. Thank you Sharmi and please visit again. To The Happy Gentleman, I hope your wife liked this recipe. Happy cooking! you named it after me????!!!!!! awwww shuckz! yeah i think i ate the most mushrooms in my life when i was with you. but those were awesome!!!!!!!! i didn't really mean you were moody.....i thought you were indifferent sometimes.....like we all are. n i can say now......i really didn't like the figs! no no no! And due to the fact that I didn't see you 4 years, I must say seeing you again was wonderful n I did enjoy every moment(except when you were mooody! )i kid i kid! n yes! i do love mushrooms! Marina, I was delighted to cook for you! Miss you so much.